Callum Hudson-Odoi has decided once and for all he wants to leave Chelsea this month – but Liverpool’s late attempt to beat Bayern Munich to his signature looks set to end in frustration. According to The Sun, Chelsea’s capture of Gonzalo Higuain on Wednesday evening has convinced the teenager to push for a move away from Stamford Bridge. The Argentine hitman joined the Blues in a long-awaited deal on Tuesday, completing a loan switch from Juventus until the end of the season – cutting short his temporary spell with AC Milan in the process. Chelsea have an option to buy Higuain for €36million (£31.3m) or extend the loan for another season in the summer, though will have to pay an €18m (£15.6m) fee to secure the 31-year-old’s services for an extra 12 months. 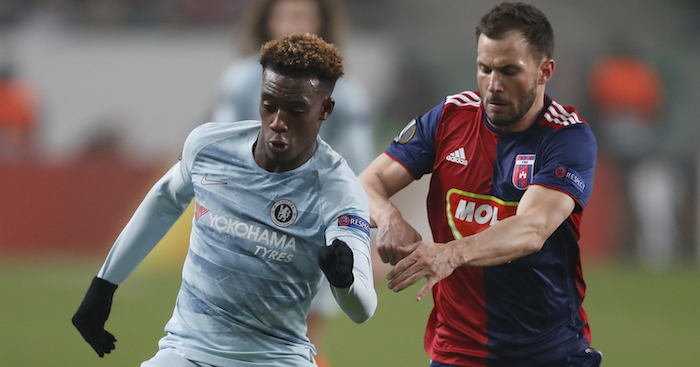 Although operating in a different position, the paper claims Hudson-Odoi feels his chances of first-team football under Sarri will be further restricted by the signing of the Argentina striker, with the Chelsea youngster having only played in 61 minutes of Premier League football this season. Bayern Munich look the most obvious destination for the player, having submitted four transfer bids to Chelsea – the last of which reached £35million, with the Bundesliga club even offering him Arjen Robben’s No.10 shirt. However, it emerged on Wednesday, via German paper Bild, that Liverpool had made a late play to rival Bayern for Hudson-Odoi’s signature after manager Jurgen Klopp made him one of his two top transfer targets going forwards. But despite Liverpool meeting with Hudson-Odoi and his agent brother, it’s reported that the 18-year-old has his heart set on a move to Bavaria, having already had certain guarantees on his playing time and having witnessed the success another young Englishman, Jadon Sancho, has enjoyed in the Bundesliga. The departure of Arjen Robben and Franck Ribery from the Allianz Arena at the end of the season presents Hudson-Odoi with a very obvious route into the first-team, whereas at Liverpool he would be competing with the likes of Sadio Mane, Mohamed Salah and Xherdan Shaqiri – depending on the system Klopp plays – for a starting spot. The paper claims Hudson-Odoi will meet with Chelsea officials this week to inform them of his decision and in an attempt to push through his move to Bayern before the January transfer window closes. The post Liverpool on tenterhooks as Hudson-Odoi makes mind up on Chelsea exit appeared first on teamtalk.com.